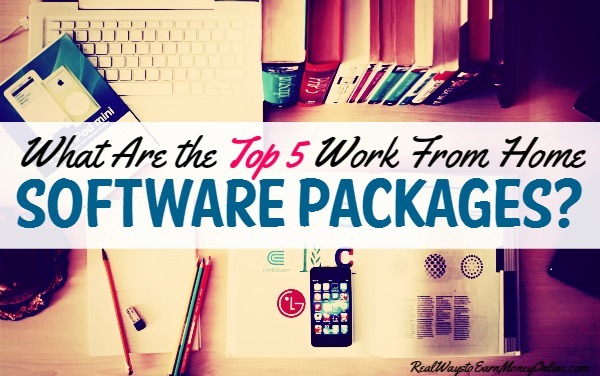 What Are the Top 5 Software Packages for Working From Home? Published January 25, 2015 By Leisa Good This post may contain affiliate links. Regardless, I only recommend sites I've researched and/or used and trust. Can you really just own five software packages to work from home? Which five software packages will it be? How do you decide on just five? You want to work from home, and you know that you will now be responsible for your own computer and its maintenance. This also means that you have become the “purchasing agent” for all of your software packages and downloads. So, where do you begin? What Would Be the “Bare-Bones” Basic Software Packages That You Will Need? What I did to collect this information was to go out to a call center and ask the agents there what they felt were the five most basic software packages to use. Then I headed on over to a few of my Facebook freelance groups and asked there. I received answers to software packages that I never even knew existed. I also sat down and picked my own brain for a while, pulling from my six years of self-employment. Also, keep in mind now that which software you choose to use will also reflect on the type of work that you will be doing from home. Obviously, if you are going to be doing graphics or transcription, you will need additional and different software to do those types of jobs. What Are the Five Runners-up When It Comes to Software Packages? When Do You Decide to Use the Paid Version Verses the Free Version of a Software? That is really up to you to decide. While most software packages will have a free version, they will also have a paid version with more added features. It will be up to you to decide if the added features are what you need. A good rule of thumb is to try the free version first, then see if it lives up to its claims. Even software that you buy will offer you a trial, so try it and see. Even if you decide to go with a software package, it doesn’t mean that you have to stay with it indefinitely. Savvy work-at-homers (WAHers) know to always stay ahead of technology and be ready to occasionally cancel one service and go with another more competitive or less expensive one. Sometimes a free version will be phased out, and you will need to pay in order to continue using the service. Again, it is up to you to decide what you need, not what the software companies think you need. How Much Software is Too Much? You never want to have so much software downloaded on your computer that you run out of disk space or crash your computer. Also, sometimes two antivirus programs will begin attacking each other and crash your system. I had that happen to me one Labor Day weekend, and I had to log into the system in safe mode and delete one antivirus program from the control panel. Also, it goes without saying, pay attention to your budget. If you can’t justify spending the money for additional software at this time—don’t. You can always add it in the future. What About the Continuous Software Updates? All well-designed software that strives to keep up with advances in technology and the continuous security threats will have occasional updates. Most updates are covered for the duration that you own it up to your expiration date. Occasionally a software will update and offer a deluxe package over a basic package. Again, which package will you need? Also, which package can you afford? In Conclusion, What Can Be Remembered When Selecting Software Packages? Will the free version work for me? Is there a better software package to replace what I am currently using? So enjoy working from home and choose your battles and your software wisely. In addition to Avast and MalwareBytes, I recommend CCleaner. It delete cookies, temporary files etc. It’s free and has a paid version.